Potential Induced Degradation can cause significant losses in PV generation. While the effect is not very common, it can become a major problem in certain environments and electric configurations. The measurements presented here have been taken by Zehndorfer Engineering during a failure analysis mission in a country of the Middle East, where temperatures are above 40°C (104°F) and relative humidity is above 50% for a good part of the year. Potential Induced Degradation is a deteriorating effect on PV panels caused by the migration of ions (e.g. Na+ ions) in the cell-encapsulating material. These ions and their electric charge cause the top layer of the cell to be inverted, which cancels the mode of operation of the cell’s photo-diode. The effect of Potential Induced Degradation can be reveled with the help of a high-quality infrared camera. The typical pattern shows warmer cells at the edge of the PV panel, due to the fact that the frame has ground potential and thus is able to feed positive charges towards the negative cells. 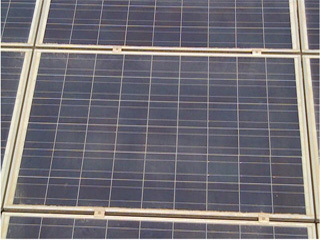 The following images show an affected PV panel. 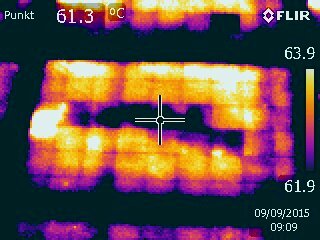 No optical alteration can be observed (see photograph on the left), but the IR image clearly shows, that the cells close to the edges are much warmer - the typical PID failure mechanism. 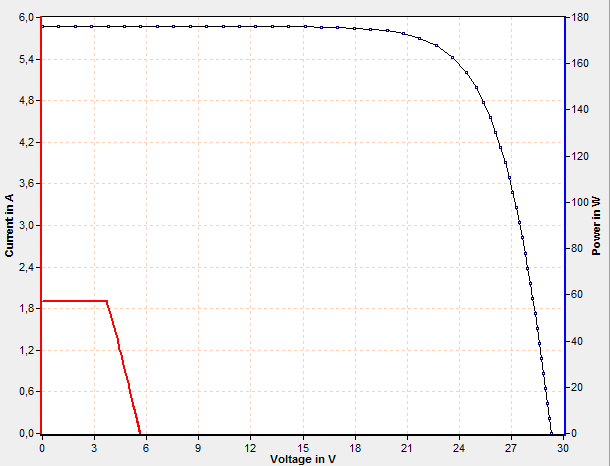 The IV-curve of the affected PV panel (in red) shows a significant reduction in voltage and current compared to the nominal curve at a certain irradiation and temperature. Inverted photovoltaic cells will no longer act as photo-diodes, which convert light into electricity, but as elecrical resistors. These resistors are in series or in parallel to the remaining photo-diodes and thus cause the reduction of current and voltage. Typically the effect is stronger at the end of the string, where a higher negative potential (compared to ground) will increase the accumulation of poisitive ions.